You’ve just downloaded a new app and you’re eager to start exploring its various tools and features. But moments after you delve into the user interface, you’re rudely interrupted and channeled into a 12-screen tutorial. And to make matters worse, there’s no “got it” or “exit” button. So you’re forced to hit the “next” button on screen after screen. You didn’t want to get sucked into a mandatory 10-minute lesson. You just wanted to explore a new app at your own pace. Yet later, when you actually do have a question—a question that may have been addressed in the tutorial that you skipped through in a moment of sheer annoyance—you can’t find the answer. When it comes to your own app, you’d like your users to be able to avoid this all-too-common scenario. So how can you work with your developer to ensure you have an in-app tutorial or virtual tour that’s useful, without being annoying? The key is to ensure that your UI/UX aligns with your users’ habits. When optimizing user experience with a tutorial, the most basic consideration is the “when.” Instead of front-loading a tutorial or virtual UI tour, develop your app so the tutorial is triggered to appear after at a few screen loads or launches. This provides the user with an opportunity to interact with the tutorial after getting acquainted with the app. They’ll absorb the information more effectively once they have a solid frame of reference. Don’t add features that create a negative user experience in an attempt to avoid a negative user experience. In the moments directly following a download, users typically prefer to explore their new app in order to get a feel for its architecture and try out the various features. Immediately and forcibly funneling users into a tutorial contradicts the way most users interact with mobile applications. Front-loading is often the source of a bad experience in the most critical moments for your app, potentially triggering an uninstall before the user has even had an opportunity to interact with the UI. This could be a big reason why 77% of users will delete a new app within 72 hours of the initial download. Some learn by reading the instructions; others learn by doing. The latter group naturally prefers to learn through trial and error, even if that trial and error process is a bit more time-consuming. Studies have revealed that learning through experience activates and engages more areas of the brain and this results in a richer (and in some opinions, better) learning process. This supports the use of optional tutorials and teaching tools that include demos which prompt the user to perform a desired action. Bottom line: learning styles differ, so you never want to force users to enter or complete an app tour or tutorial. This just creates unnecessary frustration. Always keep tutorials optional, with a button that allows users to opt out at the onset. The capability to exit at any point is key for longer tutorials, as many seek help with a specific issue in mind, moving on once their question has been addressed. Show, don’t tell! Text-heavy app tutorials are poorly received because they’re time-consuming, boring, and hard to read on a small screen. Readers want tutorials to be quick, intuitive and easy to read! Present information in a way that’s both effective and easy to consume. You can even integrate fun, gamified tutorial elements if this approach aligns well with your branding and target audience. In a vast majority of cases, users are seeking an answer to a very specific question. But they don’t want to read through 8 or 14 screens of content to find the answer. For this reason, you should provide multiple one or two-screen tutorials, each addressing a very specific feature or function. This also allows you to scatter brief tutorials throughout the app. It’s generally most effective to include a simple question mark or lifesaver icon in your user interface. This icon enables users to access brief tutorials that are specific to a particular screen. In addition, you can also integrate a “knowledgebase” that serves as a central depository for tutorials on various topics. This can work for more complex UIs, like those of enterprise-level mobile apps. No matter what teaching tools you choose, they should be easily accessible from every screen in your app. Users need to be able to find the help they need when they need it. To avoid user frustration (and ultimately, app deletions), the tutorial icons should be in the same location from screen to screen. If you have a knowledgebase, that link should also be easy to find and consistently located throughout the UI. When crafted in a user-friendly manner, tutorials and guided tours can be useful assets within a mobile app. But when executed poorly, you can end up alienating potential users before you’ve really had an opportunity to engage them. 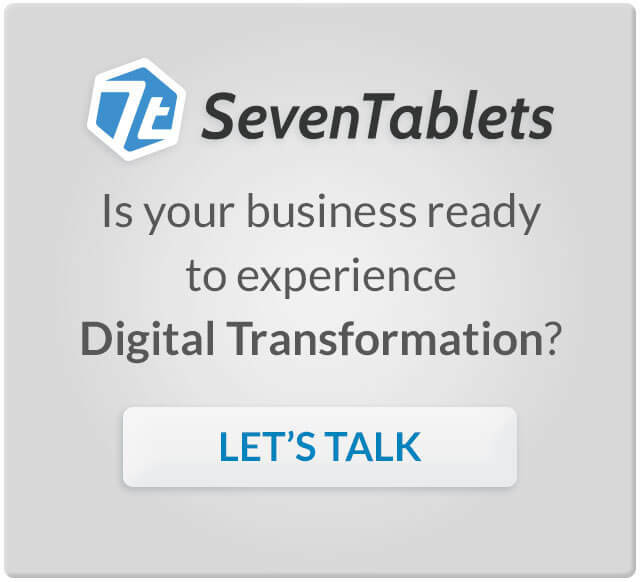 To prevent this, the team at SevenTablets takes a user-centric approach to app development. We balance the needs of not only the client, but also the end users. This strategy ensures your application’s user interface is intuitive and effective, whether you’re creating a one-of-a-kind digital interface or a B2C app to engage your target audience. Contact us today to discuss your goals for your mobile development project. Why Create a Mobile App for Your Business?